My bro is getting at me for recommending an Advent Calendar on December 17th. He has a point I suppose. But I like to think you, gentle reader, are not some Jonny-come-lately darting around the internet in a panic last minute book recommendation spree but a Quiet Ponderer who may require a year to mull the pros and cons of a particular purchase. Christmas ain't going anywhere after all. And that is very much the point of Christmas. We like it to be the Same please. The good bits and the less good bits. I like to have turkey with the Constance Spry almond sauce I have had since childhood and none of your goose-is-actually-nicer-and-you-know-strictly-speaking-more-traditional nonsense is going to sway me. I'm the same with my Christmas books. There are some excellent new Christmas titles I know and I'm all for them and that but there are still only two titles I actually NEED for it to Be Christmas. The first is (no surprise) Shirley Hughes' 'Lucy and Tom's Christmas' , the second 'The Tailor of Gloucester' by Beatrix Potter. This is also poor practice from me because 'Lucy and Tom' is out of print I'm afraid and only available second hand at inflated sums. But then we don't actually own a copy ourselves. One of my first Christmas jobs at the beginning of December is to go and stake out the local library until they bring out the Christmas stock and then pounce on their copy, hawk-like. Apologies are due to other North London residents who've been denied it for the last 6 years because it has been ours all ours (cue wicked laugh and hand rubbing). 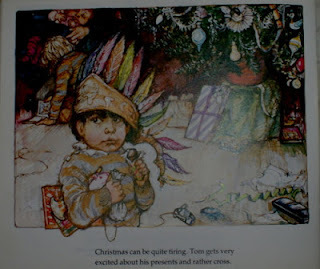 I love it so because it is a perfect evocation of a perfect Christmas through child's eyes and because it encapsulates the importance of Sameness. I read it and recognise my own childhood Christmas's and Bill and Eddie read it as a documentary list of How Things Should Be. It's a proper lump in the throat read for me. 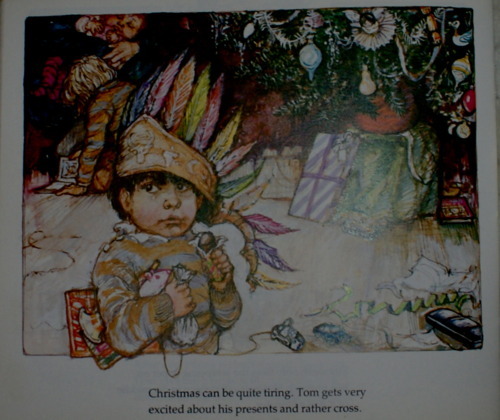 Shirley Hughes just gets it spot on right again sigh: From the list of elaborately chosen, wrapped, hidden and re-hidden gifts Lucy and Tom choose: "A comb in a case for Granny with 'A' for Alison on it (because that's Granny's name)...a rubber in the shape of a dog for Dad to take to his office" to the exposition of the day itself; "Imagine not wanting to wake up early on Christmas Day!" 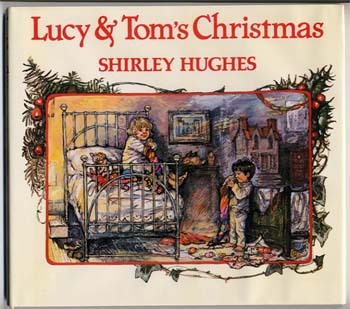 the genius of Shirley Hughes is to be able to write something that can be read as truth by both grown ups and children without either feeling patronised or excluded from insider knowledge. I suppose it is a very middle class and ever-so-slightly sentimentalised version of The Day (there's even snow)- but phooey to that. It's my fave. 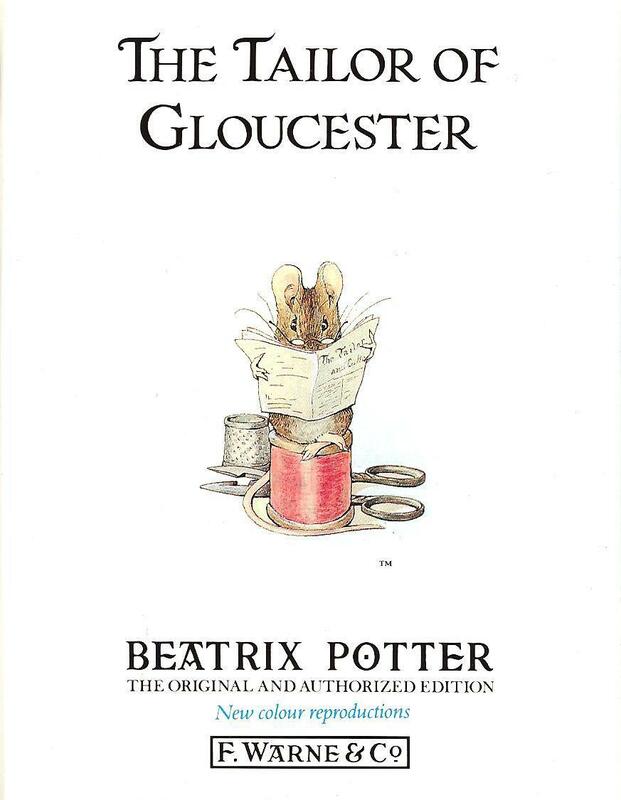 I am a bit too old to have got 'Lucy and Tom' on their original outing but we had a complete library of Beatrix Potter and 'The Tailor of Gloucester' was read to me every Christmas Eve for many years. Now most Potter I find either sickly or creepy ('Samuel Whiskers'! 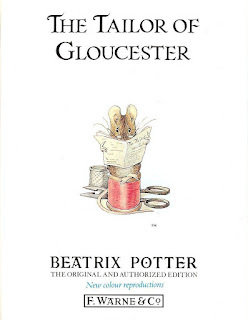 -nightmares reborn) but 'The Tailor of Gloucester' is still a Christmas treat. 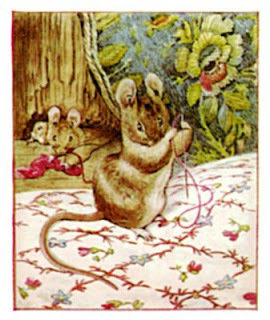 Should you not know it; it's basically 'the Elves and the Shoemaker' with added mice and a certain amount of jeopardy. I was always a sucker for anyone lying around at death's door in books when I was a child too (see 'What Katy Did', 'Heidi' or 'The Secret Garden' for instance). I did a lot of pretending to be a nearly-dead Maid Marian or Batgirl. It may be more a girl thang, or just a me-thang: My boys, thankfully, are less interested in starving and consumptive-style swoons such as that which wracks the poor Tailor. They do like Bad Simpkin the cat though. 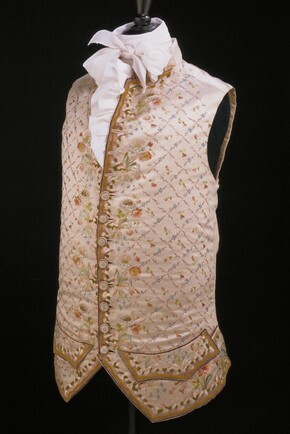 I hadn't realised until Playing By the Book did this amazing round up of museum artefacts in children's books that the waistcoat that the Tailor must complete in time for Christmas day is a real object viewable in the V and A. A post-Christmas pilgrimage must be made one day. And after all this posting on the Sameness of Christmas's past, I have to confess that this Christmas is going to be rather different. We're all off to Australia at the end of the week to spend two weeks in the sun with family. The blog will be on a bit of a holiday until January and I am in a flurry of trying to locate put away sunglasses, hats and shorts (the problems some people have eh?). However although there may be a few prawns on a barbecue this year there will still be almond sauce. phew. Happy Christmas and Happy 2013! Please visit the V&A on my behalf and say hello to the waiscoat! WOAH... Australia?? Wow. Have fun!